MamaBreak: POPSUGAR Must Have Box August 2015 Inspiration & Coupon Code! POPSUGAR Must Have Box August 2015 Inspiration & Coupon Code! 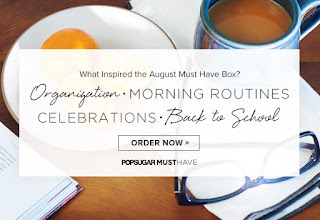 POPSUGAR released the inspiration for the August 2015 Must Have Box on Monday! Let's check it out! Organization. Morning Routines. Celebrations. Back to School. I love it! These all sound like great ideas for August to kick off the new school year! There are SO many items that they could use that would fit in with the organization, morning routines, and back to school part of it. The one thing that has me stumped is "celebrations" though. Hmmm. I wonder what that could be? My only guess is that August is the "birthday" month for the POPSUGAR Must Have Box. What do you think about the inspiration for the August 2015 POPSUGAR Must Have Box? Do you have any guesses about what might be in it? Comment below with your thoughts! I would love to hear them! If you are interested in ordering this box and are a new subscriber, use the coupon code “MUSTHAVE5” when you checkout to get $5 off your first box! Click here to order your August 2015 PopSugar Must Have Box before they are sold out! The true reason for this is very uncomplicated. Your possibilities usually are taken over because of the advantages on the chanel outlet from the vogue marketplace, along with the vogue marketplace will probably bombard this promotes while using the most up-to-date cohesive libraries just about every year. A lot of the alain silberstein wristwatches are also available in flamboyant in addition to thrilling hublot replica uk bringing in multihued conditions, decorative hands and wrists in addition to energetic household leather ties. There're loaded with attributes. Even so, unique chanel replica accompany cool features using the purchaser collection there're intended for. In particular, fake wristwatches intended for adult males accompany attributes including fake wristwatches manner and even more. Many people intended for rolex replica uk accompany attributes including security and even more. Alain silberstein wristwatches element stainless steel or maybe titanium conditions, outstanding household leather or maybe precious metal belts, the start explanation anti-glare sapphires, water-repellent attributes, intelligent chronograph mobility, calendar features in addition to charges which might be a reduced amount of with audemars piguet replica sale towards value connected with services they furnish.